Wow, it’s already May! Time flies when you’re are having fun, and we all know that Downtown Pensacola, with all the wonderful shops, restaurants, nightspots, and popular events, is the place to be for fun! It’s especially exciting because the start of May will bring us the opening day of the Palafox Market’s sixth season! 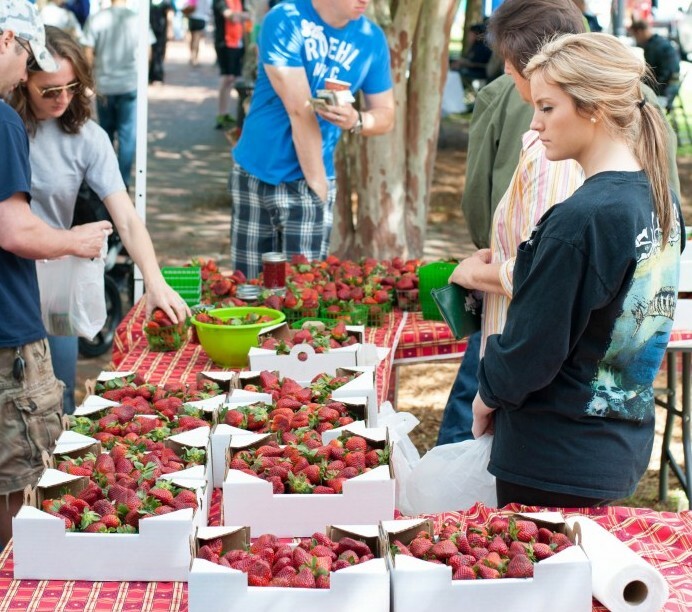 The May 2013 – April 2014 market season will kick off Saturday, May 4th, 8am – 2pm, rain or shine in Historic Downtown Pensacola! The Palafox Market is Downtown Pensacola’s very own farmers market! Farmers markets have been in existence for many years, but the last 10+ years have seen an unprecedented nationwide growth. According to the USDA, the number of farmers markets has grown almost 200%, from 2,863 markets in 2000 to 7,864 in 2012. As farmers markets continue to be fresh food mainstays, these numbers continue to rise. Farmers markets provide access for shoppers across all socio-economic, political, and ethnic ranges. In addition, farmers markets are playing a pivotal role in the “Shop Local” movement. Farmers markets positively impact local economies, improve community health, and bring diverse groups of people together through a shared social space. The Palafox Market is excited to be a part of this growing trend and all the positive benefits it brings to Downtown Pensacola and the surrounding community. The Palafox Market was started in 2008, as a joint venture between the DIB and CRA, in order to increase additional economic development in our Downtown area. Over the last five seasons, the market has expanded to become a year round event and a Saturday staple in Downtown Pensacola. On any given Saturday, the Palafox Market, which is now located in all three medians of the Martin Luther King Jr. Plaza, hosts over 85 vendors and thousands of customers! Palafox Market customers come from all over the region, to shop for fresh local seasonal produce, meats, and plants. Shoppers also love the delicious homemade foods, jams, sauces, and honey available at the market. The local shopping continues with the Art and Antique sections of the market! A Saturday shopping trip will reveal the award winning fine art, pottery, jewelry, an amazing variety of soaps and candles, custom textiles, unique antiques, and more! The Palafox Market is also considered a “must see and shop” destination for tourists visiting the Pensacola area. You might even see the chef, from your favorite restaurant, buying the ingredients to use in their next culinary masterpiece. The dedicated vendors, of the Palafox Market, offer items that are grown or made within 100 miles of Downtown Pensacola. Have a question about a product? The vendors of Palafox Market can answer it for you! When will my favorite produce will be available? How do I keep this plant alive? What are the benefits of local honey? How did you create this amazing painting? What’s your best soap for sensitive skin? Can you make some custom jewelry for my loved one? Palafox Markets’ knowledgeable and accommodating vendors will have the answers to these and many more of your questions. Vendors vary weekly, so it’s always a great new experience shopping at the Palafox Market!